1993 Stadium Club. Not a set I really care that much for, aesthetically, but it does have a batch of cool, tough-to-find variations. 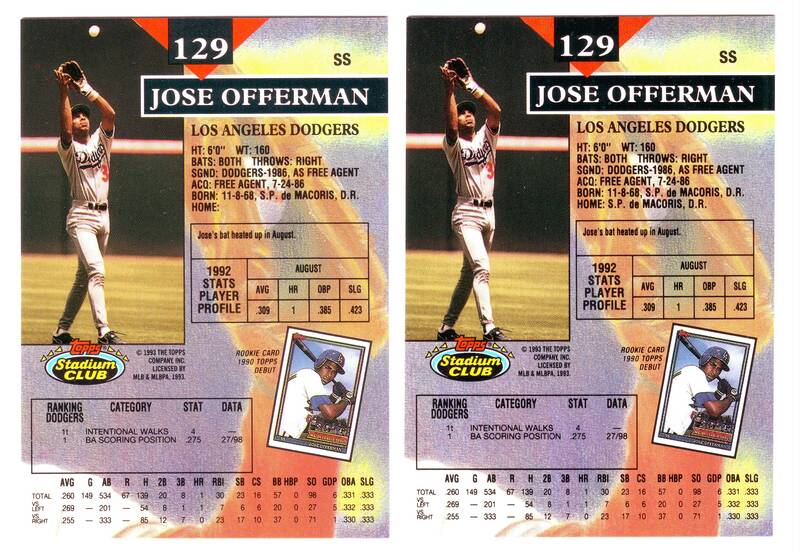 The most well-known among them is Jose Offerman’s card #129. The early versions were those printed without any information after the word ‘HOME:’ on back. Another interesting variation has popped up in the 1993 Topps set. While I am certain that many Albert Belle and Cleveland Indians collectors have noticed this error for some time, it may be relatively recent that a correction attempt has surfaced. 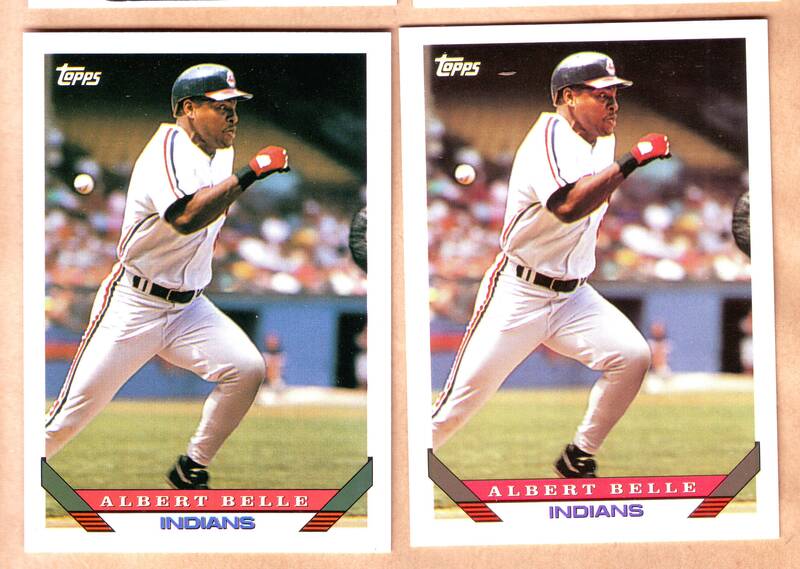 Albert “Don’t call me Joey” Belle’s card has a glaring design error on the card front: It’s banners are green instead of the correct, blue, like the other Indians players. Check out the card on the right. After breaking 2 1993 Topps factory sets, I have found a copy of this “gray banner” version in each. Methinks that this was Topps’ way of fixing the Belle mistake. Subsequent 1993 Topps Series 2 boxes I ripped open yielded more of the “green banner” versions. While it’s not Pancho Herrer rare, its still a tough single to come by without breaking down a set. 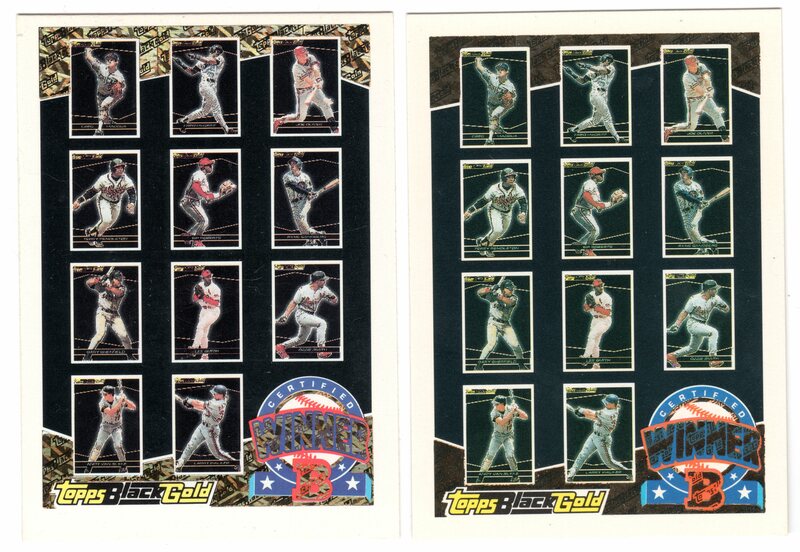 I will continue to post about 1993 Topps variations as more surface. 1993 Topps contains a handful of variations which I will outline in a later blog. 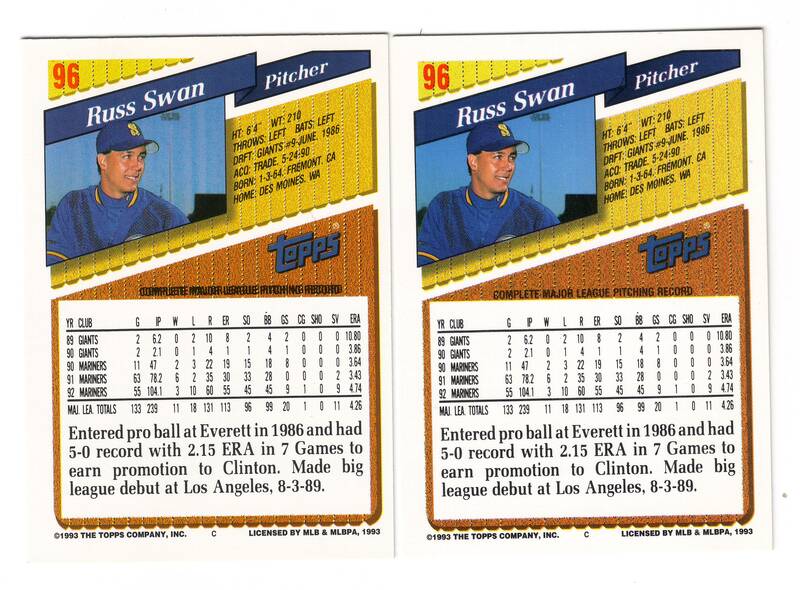 But for now, take a look at one of the weirder ones: #96 featuring Mariners pitcher Russ Swan. The first version has the “Complete Major League Pitching Record” heading printed twice. The second corrected it and shifted it to the left as well. Though one can never be sure, I am almost certain that this is one of my own discoveries as it had previously not been mentioned as far as I know.